Earlier this week, I mentioned two articles on romantic crime films that I’d written for the current and upcoming issues of Mystery Scene, but I’ve also been thinking about crime films in another direction recently. Over the past few weeks, I’ve been finishing up a course proposal for George Mason University tentatively entitled “Crime Stories: From Page to Screen,” an idea that was first suggested to my by my good friend and fellow writer and teacher John Copenhaver, who will be teaching a similar topic at a local private school this fall. He and I are diverging a little in the books and films we’re considering for our respective courses, but the thrust of the course is the same: to look at film adaptation as an act of interpretation (just as many of our students interpret texts themselves) and to examine both the thematic and stylistic choices that each author or director makes and the different tools available in each form/medium. 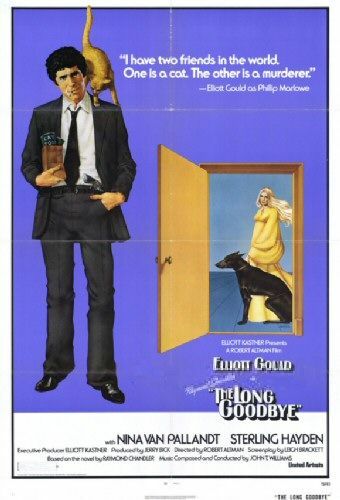 The first book/film combo that jumped to my mind for this was The Long Goodbye — Raymond Chandler’s longest book (and some might argue, his best) and then Robert Altman’s delightfully different take on the book, updating a ’50s hero to the early 1970s and making some significant changes not just to the tone and the character but to the plot itself in the process. Another good combo that boasts different treatments of the story is In A Lonely Place by Dorothy B. Hughes, which got a reworking as a vehicle for Humphrey Bogart, and I personally would love to discuss the two different treatments of Patricia Highsmith’s The Talented Mr. Ripley: Rene Clement’s Purple Noon and then the Anthony Minghella version with Matt Damon in the title role. And Memento is a must, of course, looking at how an unpublished short story (from a college course!) became an instant classic. Even Bonnie and Clyde would offer some interesting possibilities, maybe looking at original newspaper accounts and what the screenwriters did with those “texts” to write Arthur Penn’s 1967 film. The key, to my mind, is not just to find a book that’s been made into a film — there are a blue million of those out there — but rather an adaptation that does something significantly different in “revisioning” one text into a new medium. And Now That The Book Is Available….